I was really hoping I wouldn't end up with so many "parts" to this story but with 2 kids and a HUGE project that keeps on growing, progress is slow. This weekend, little Sugar Pop was sick so I had to split my time between consoling him and working outside. Mr. BSR does a much better job with the Snickerdoodle so when it comes to dividing our parental duties, he takes point with the big kid and I take care of the little guy. On a happier note, I answered a Freecycle ad for free granite scraps and was the first one who actually showed up to get the goods so they're ours, all ours!! That's most of it, there are just a couple of other larger pieces we had to set somewhere else. 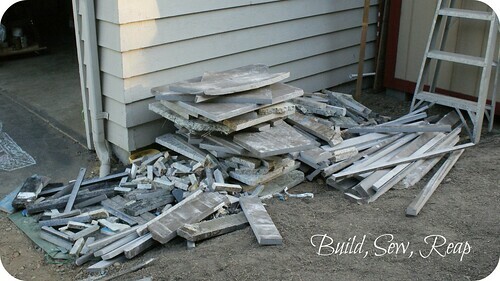 You might be wondering what we'd do with all those little scraps of granite? Well, build a garden path of course! 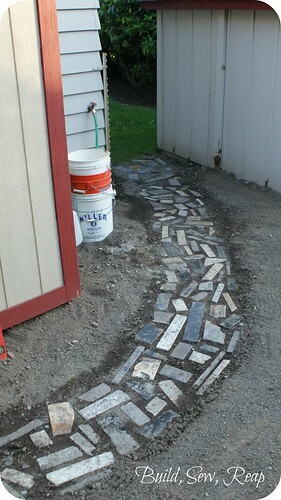 We have enough scraps to build one main path then an offshoot or two. 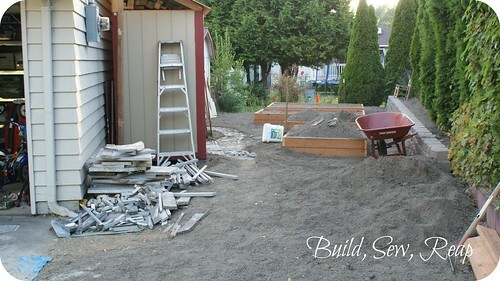 I might even stretch it all the way from our side yard to the back patio - we'll see how ambitious I get. I've left it relatively narrow which I can change if I decide to later but for now, I really like the proportion. We plan to just let grass or moss or whatever green wants to grow between the stones grow to make it easier to maintain. We've made conscious decisions not to add any new areas that will need to be weeded regularly. For this path, we're just going to let nature do whatever it wants to. We also distributed more of the dirt from the main mound, Mr. BSR removed all the hardware from a HUGE pile of wood we salvaged from the old carport, we took care of a sick infant and a rambunctious preschooler and I started an indoor project I promise to blog about sometime in the next few days. I'm not even going to bother listing out what more needs to be done ... the list didn't change much from last week but you can see that some progress was made.